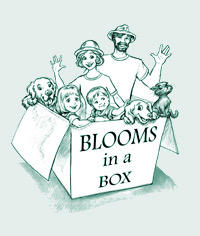 Bloom River Gardens is a family-owned nursery located in the hills overlooking Oregon's McKenzie River Valley. We feel fortunate to live and work in a climate supporting a wide diversity of plant types. 2017 will mark our 39th year in business. The highlights of our mail order plant and online nursery business are the unique, rare, and unusual landscape plants for the creative gardener. We are currently growing over 300 species in the nursery plus over 1000 varieties of plants. These include daylilies, wisteria, ferns, conifers, Japanese maples, hostas, specialty azaleas and rhododendrons, and more. Our plant selection is always expanding and changing. We are hopeless garden lovers, so visit our online nursery site often to see what new plant varieties we have come up with! Some of our stock is simply too large to fit in a shipping carton! But if you are ever in our area, please feel free to call for an appointment and come take a tour of the nursery and gardens. And if you are driving your own car, you might be surprised how many plants we can fit in the back seat! We strive to provide first-rate plant material and exceptional personal service to our customers. Country boy at heart. Clean in the morning, pretty dusty by the end of the day, but doesn't care. Sometimes forgets to comb his hair, but his hat usually hides this fact. Hates ironing clothes. Mellow, great sense of humor, a dreamer. Loves kids and animals. Thrives on working in the nursery. Loses track of time. Has been known to turn on the lights of his John Deere tractor, so he can see to finish a job after dark. (Values his tractor second only unto his wife...she hopes.) Willingly jumps into any project Val thinks up for him. Sometimes gets dragged, kicking and screaming, to a theatrical production. Former high school teacher with Master's degree in education. Confirmed bachelor for 39 years before Val and her kids caught up with him. Wouldn't trade his life for anything. Transplanted city girl. Clean in the morning, dusty by the end of the day and DOES care. Likes clean fingernails. Always combs her hair, but why (?) since her hat promptly messes it up. Hates ironing clothes, but does it anyway to preserve her image. Has been known to put on make-up before going out to work in the garden. Loves being a mom. Loves being a grandma even more. Collects animals, rather they collect her. Practical. Always knows what time it is. Has questionable work ethic after a 14-hour day. Refuses to work by tractor-light. Loves ballet, musicals, and old movies. Has degree in journalism and food science. Retired from career in photo advertising to work full time in nursery. Discovered she likes garden design and living in the country. Wouldn't trade her life for anything. Mark and Val's 4-year-old granddaughter. Likes to visit and help Grammy bake cookies, muffins and "punkin" pie. Enjoys making apple cider and planting seeds in the vegetable garden. Loves feeding bits of grass to the horses, throwing corn to the geese and floating paper boats in the creek. Wants to drive the tractor. Totally darling, fun, and unusually bright. Thinks life on the farm is a very exciting thing! Mark and Val's 10-month-old grandson. Was only supposed to be 8-months-old at this point, but (Surprise!) decided to join the family 60 days early. Likes being held, being dry and being fed. If above requirements are met, is very happy boy. Wonders why his grandparents are always making silly faces at him, but laughs obligingly. Likes to grab beards, dog ears and cat tails. Hasn't seen the tractor yet, but is bound to find out about it soon. Doesn't really think much about life, yet. 8-year-old Golden Retriever. Beautiful wavy hair, fluffy upturned tail, smiles a lot. Extremely intelligent and anxious to please. Will attempt to do anything the crazy humans ask her to. Helps carry things in the garden. Has some sort of object in her mouth at all times. (Articles of clothing, sticks, balls, packages of cookies, empty flowerpots and miscellaneous debris.) Champion Frisbee catcher. Thinks life is a party and she is the guest of honor. Golden Retriever puppy with impressive pedigree. Soft creamy coat, dreamy brown eyes, sunny disposition and very active mouth. Loves eating shoes, cookbooks, antique quilts and fringes on oriental rugs. Likes digging holes in the garden and pulling up plants, roots and all. Mud puddle expert. Worships Meggie, but has yet to pick up any of her good habits. Adores Mark. (They flunked out of Puppy School together.) Thinks country life far outweighs obedience and the show ring. Large black cat. Moved in about 2 years ago. (Found out Val couldn't say no to starving stray kittens.) Tremendous sense of humor. Loves teasing and excels in unacceptable social behavior. Has great time "helping" Val in the garden. Lurking-behind-bushes specialist. Hide-and-pounce favorite game. Thinks life is grand. "Pasture potatoes". Spend most of their time hanging over gate waiting for dinner. Registered Arabians, but much of their proud heritage got lost somewhere in the feed bin. Spoiled. Take life for granted. Have large pond to swim in, but wander everywhere on the farm. Sometimes cause traffic jams while taking single-file walks on the road in front of the nursery. Have no respect for life. Thanks to artist Ruth Elliott for contributing the caricature drawings to our web page and catalog. No one has captured Woody's personality in black and white quite so well.